Ideal as an add-on to the Bluetooth Ceiling speaker or as a standalone passive speaker for other hardwired systems this 2-way in-ceiling loudspeaker delivers powerful and clear sound. The frameless design with grill that magnetically attaches to loudspeaker only protrudes 3mm from the ceiling. The grill can be painted with ceiling paint to create a virtually invisible look to these high performance speakers. 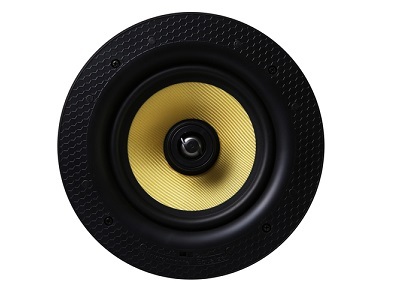 Featuring a Kevlar woven woofer cone, the strength of Kevlar helps the cone retain its shape at very high energy levels and its low mass assures quick, accurate response. The cone’s woven surface delivers smooth, uncoloured mids. The high quality rubber surround ensure that these woofers will provide years of consistent, reliable performance.